The aerobie dogobie flying disc's flexible but tear and puncture resistant material is gentle on your dog's mouth and teeth but sturdy enough to endure fetch after fetch. 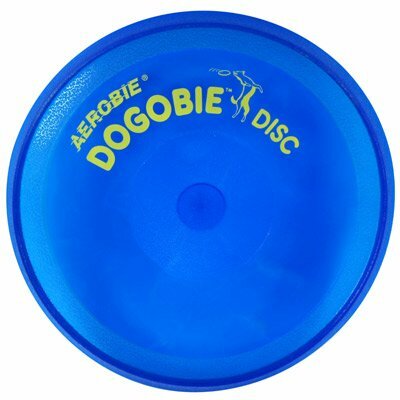 With its patented spoiler rim design, the dogobie disc is made for long, stable flights even when thrown by a beginner. Floats in water. Size: 8 inch diameter. Available in blue and yellow, the two colors seen by dogs. (Dogs see other colors as shades of gray.) Quality made in the USA. Colors may vary. Please contact us for more specific color requests. Available colors blue and yellow. available colors may vary. If you have any questions about this product by Aerobie, contact us by completing and submitting the form below. If you are looking for a specif part number, please include it with your message.